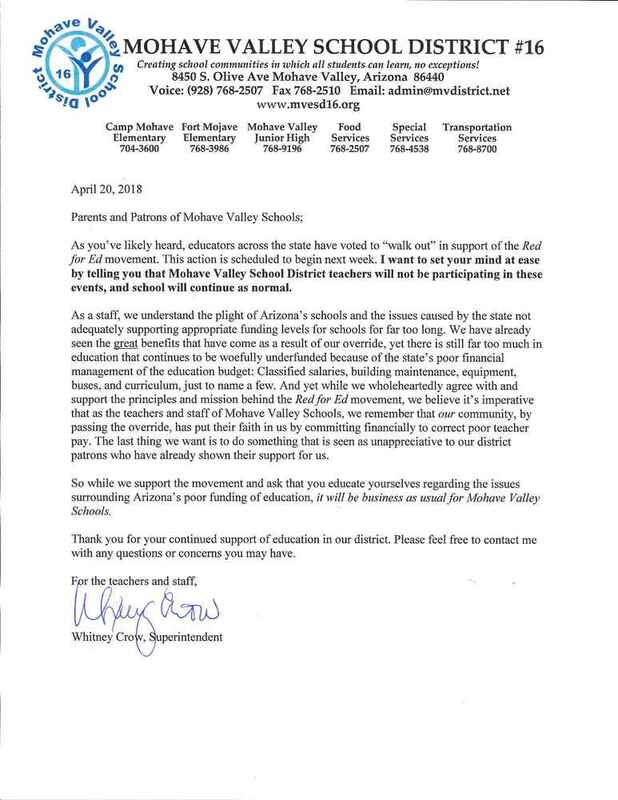 In light of the #RedforEd protests facing the state of Arizona, Mohave Valley Schools would like to assure patrons and parents that school will operate as normal during this time. "It's not that we don't support the outcomes sought by the #RedforEd campaign" noted Whitney Crow, Superintendent. "We are all in agreement that for the past 10 years, education funding in our state has left schools in poor shape financially. This has not only hurts schools and staff, but the quality of education we can provide, which ultimately hurts students themselves". "That being said" continues Crow, "The voters of our district addressed at least part of the issue by approving a budget override in the Fall of 2016, which has allowed us to significantly raise our base teacher salary, allowing us to not only retain our outstanding teachers, but attract qualified, experienced candidates to fill any openings we may have. Because of that, our staff believes our loyalty must remain first with our parents and community who have already taken personal measures to improve our schools". For the district's complete statement, please reference the notice sent home on April 20th (found above).